Terry E. Branstad, a Republican from Lake Mills, Iowa, was first elected as Iowa's 39th Governor and the youngest in the nation. He served from 1983-1999 the first time. He was born in Winnebago County on November 17, 1946, the son of Rita And Edward Branstad of Forest City. He grew up on the family's century farm near Leland in Winnebago County and graduated from Forest City High School in 1965. He received his B.A. degree in Political Science from the University of Iowa in 1969. Following two years in the U.S. Army, where he was awarded the Army Commendation Medal, Branstad earned his J.D. degree from the Drake University Law School. Governor Branstad and his wife Christine have three grown children, Eric, Allison, and Marcus. In 1997, he chaired the Education Commission of the States, the Republican Governors Association, and the Governors' Ethanol Coalition. He also served as Chair of the National Governors Association during 19891990. Persevering amid the economic recession and farming crisis of the mid-1980's, Iowa became the first state to link every school district in a broadband network. After leaving office, he founded Branstad and Associates, L.L.C. He also was a partner in the firm of Kaufman, Pattee, Branstad & Miller, as well as a financial advisor for Robert W. Baird and Co., Inc. of Iowa's Henry Tippie Business College. 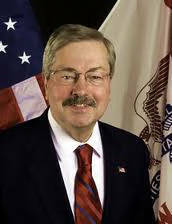 In August 2003, Branstad accepted the offer of Des Moines University to become its president. Branstad was appointed by President George W. Bush to chair the President's Commission for Excellence in Special Education. The commission was charged with developing a plan to improve the educational performance of students with disabilities. After completing his work with the commission in 2003, Branstad was asked to serve as a member of the National Advisory Council for Positive Action for Teen Health, or PATH. The advisory council encourages action toward detecting adolescent mental illness. In April 2003 Branstad was named to serve as a public member of the American Institute of Certified Public Accountants, which comprises both professional and public members who address such issues as student recruitment and professional ethics for CPAs. He served as President of Des Moines University from 2003 to 2009. In November of 2010, he was re-elected as Governor, defeating one term Governor Chet Culver.